Adults and kids are going to LOVE this pair of treehouses and bathhouse. A fantastic place to spend time in the forest...and the hot tub! Our NEW adventure...Your AWESOME vacation. The Trade Winds Treehouse is simply our most luxurious getaway in the forest. Two twin treehouses perch side by side like owls roosting on a limb. It features full electricity, running water, heat, a private bathhouse, a slide, and yes- even a hot tub! It can comfortably sleep three couples, has a sleeping loft for kids, and has an extra couch. (The sleeping choices are 1 queen bed, 2 full beds, 1 futon, and one couch). Linens are always included your reservation for Tradewinds. The treehouse has a serene view of Peregrine Rock and has ample parking. 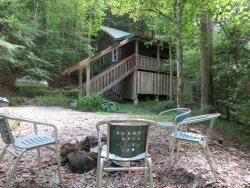 Other special features include, cathedral ceilings, recycled building materials, two decks, fire pit, and a ten minute nature walk to the Martins Fork trail head. This treehouse is great for adults, couples, families and kids of all ages! Tradewinds was meticulously crafted by a group of friends just for your enjoyment. These folks did not take your vacation lightly. In fact, great attention to detail- from carefully and artistically crafted tile shower, to the vaulted cross-gable dormer ceilings... every possible aspect of your vacation and enjoyment of this magical area and this craftsmanship of Tradewinds Treehouse was considered. We would like to say a special "Thank You" to Kara Kreutzberg, Orashe Contageux, Elias Dobiesz, Timothy Proser, amy dourson, Finn Dourson, and Aaron Dourson for literally hundreds of hours of work put into crafting this special place on behalf of Red River Gorgeous. But, it was very much a team effort. In fact, none other than the Canopy Crew teamed up to make this special project a reality. A special thank you to Django Kroner, Isabella Cowgill, Zack Tabor, Rob Hodgins (Rob Stafari), Will Sweeney, Dave, Aaron Frank, Robert, Chris, and Andrew. We couldn't have done it without you people! We would also like to thank Donald Lawson, Gary Tipton, and CB Martin for bringing loads of gravel to making the parking area. Holbrook Implement supplied the excavator used for digging the septic area so you can flush the toilet! The metal floor joists were provided by United Building Materials in Cincinnati, OH and manufactured by Clark Dietrich. Black Locust decking was provided by Price Lumber Products. Oak logs for the bathhouse were delivered by Masters Sawmill. Windows from the Bathhouse are from Walnut Hills High School. Maple flooring in the two treehouses is from the old Withrow High School Gymnasium. Full Compact Kitchen: featuring 3 burner stove, half size fridge, cookware, eating utensils, dish rack, kichten sink, rolling island with integrated cutting board, kitchen exhaust fan, and ample lighting. Interior seating in the kitchen is limited, but can accomodate 6 people with additional outside seating available. SPRING-FED HOT TUB! Enjoy in the spring, summer, fall and winter! Ample parking for 3 or more cars. Easy access to exceptional hiking trails and climbing areas, including several within walking distance.